Last month our community members working under the umbrella of Vayali Folk Group mentioned that they were planning a gathering of indigenous people of River Nila in Thrissur at the Sahitya Academy Hall. 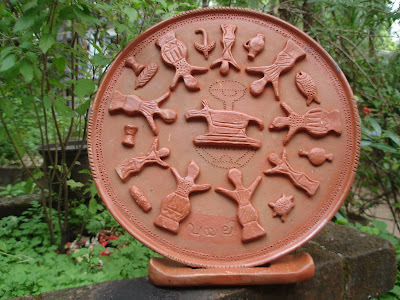 The idea was to acknowledge the work of great folk artists from Nila and appreciate them for the invaluable contribution to the unique river valley civilisation. When they told us that they also wanted to give a memento to The Blue Yonder for bringing in attention to River Nila and the efforts we have taken to revive and support art forms along Nila, we were not sure what was coming. It was after the Conde Nast traveller awards that they decided that our work needs to be acknowledged by the stake holders within our project area. In front of a small gathering of people who shared the angst of a dying river, the Revenue Minister Mr. K. P. Rajendran handed over a beautifully crafted memento (in the picture )created by one of our partner artisans ‘Narayanettan’. We would have preferred to have that acknowledgment not from a minister who had no clue about what we do, rather through a smile that we exchange normally with our community members. In the quick gate crash he made to the stage, we could hear the Minister asking Vinod, coordinator of Vayali, "who, what, Blue Yonder?". Well, since Ministers are busy running from one meeting to another and declaring one statement after the other across the state, one can't blame if they don't find any time to figure out why they are there. Minister's presence might be a media attention and he even came there because he genuinely wanted to support the initiatives of the organisers in documenting and reviving folk art forms in Valluvanad region of Nila. But we were aghast to hear the statements he was giving in his capacity as a Revenue Minister of Kerala. “Nila, as we all know is being abused and it is so much part of our culture, environment etc etc……and also considering the degradation that is happening we have decided to release Rs 5 crores (1,270,648.99 USD) from the River Management Fund." Then there was a flood of offers, about engineering departments and water authority of various levels being involved in many other projects. After the Minister left we were wondering about the number of committees being set up and how many more dollars are passing hands before they all put the final nail on the coffin, which could be our Nila!. Irrespective of the mumblings of the Minister, it was great to see many of our activity partners ( Thoni Cruise, Martial Arts experts, Folk artists, Potters, Ritualistic healers etc) being recognised in public for the first time and that too in the presence of people like Sankar of KFRI, who could connect with the people and understood why they were there. Amongst other recognitions we have received in the last four years, we don't think there will be any other that will remain so close to our heart than this appreciation from our own people.